I love SPC’s tinned fruit salad because it is perfect with jelly and ice cream. Fruit salad, jelly and ice cream makes a yummy dessert. This is jam packed with different fruits. It has a nice syrup and is very easy to eat. It does have a slight tin flavour due to living in the tin for a while but otherwise good. Nice with ice-cream or custard. 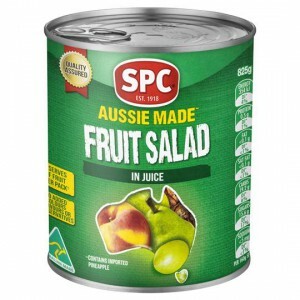 How would you rate Spc Fruit Salad Canned?